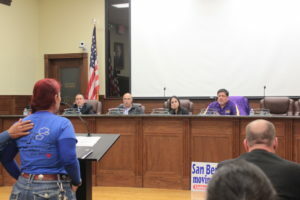 On Tuesday night’s regular City meeting, City officials discussed an item during executive session relating to an attorney consultation in order to “receive legal advice from counsel in regard to threatened litigation arising out of law enforcement action involving Mr. Richard Treviño,” as the agenda read. As previously reported, Ricardo Treviño III, 21, was fatally shot by police officers on Dec. 7, 2018 after a car chase ensued from a church on the 400 blk. of Expressway 83 and then ended in the El Ranchito area. Treviño recorded the chase and subsequent shooting via Facebook Live. That same evening, the Department of Public Safety issued a statement that Trevino’s car had reached a cul-de-sac, turned around, and struck a law enforcement vehicle head on. As a result, police officers fired. The City placed the officers involved on administrative leave, but they have since returned to their regular duties, as previously reported. In a conversation with the News before the meeting, Mayor Ben Gomez said he had personally asked to have a discussion with lawyers about the release of the officers’ names involved in the shooting.